Armadillos are very good diggers, and use their sharp claws to dig for food, which is is mostly insects, grubs, and other invertebrates. Some Armadillos prefer to build burrows near creeks and streams, close to food sources, making meal time quick and easy. 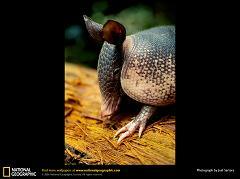 Other Armadillo species eat just ants and not much else. Armadillo poop looks like little round balls of clay because they eat a lot of soil when picking insects and small snails off the ground. Their excrement is also almost perfectly round. We’re not sure if anybody has tried picking them up and firing them in kilns, but they could make a wonderful gift for children, ok maybe not. This dirt-eating habit, by the way, is the reason that armadillo teeth are dark, sometimes even black. Are Armadillos Poisonous and Are Armadillo Bites Painful? How Did the Armadillo Get its Name and What Does Armadillo Mean in Spanish?